A monarch prepares to carbo-load on nectar before performing its royal tasks. One of the true delights of the steamy summer season in Maryland is the return of the monarch butterfly. I saw my first monarch early this year, several weeks ago in June when she stopped by my garden for a sip of nectar from a swamp-milkweed. Last autumn the ancestors of this beauty survived a dangerous and arduous migration from the eastern United States to their overwintering sites in central Mexico. During the long winter, they bested predators and weather in their highland retreats. In the spring of this year, the vagabonds flew several hundred miles from Mexico to the southern United States before finding suitable milkweed plants to serve as food for their young. 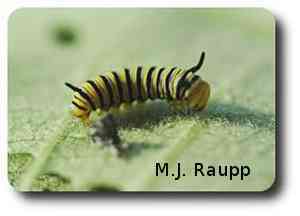 A newly hatched monarch caterpillar prepares for its first meal. The female monarch lays her eggs, usually one per plant, on the undersurface of a leaf. After several days the egg hatches and the tiny monarch caterpillar begins to consume the nutritious leaves. Like other denizens of milkweed such as the milkweed longhorned beetle we met on July 18, monarch larvae encounter the milky sap of their host plant. In the chrysalis the caterpillar transforms to a butterfly. From this latex stew they obtain potent defensive chemicals known as cardiac glycosides. These compounds are stored by the caterpillar and passed along to the adult butterfly. Birds are important predators of many kinds of butterflies including monarchs. The cardiac glycosides found in the monarch caterpillars and adult butterflies cause several species of would be predators such as blue jays to undergo paroxysms of nausea and, well, lose their lunch. The conspicuous orange and black coloration of the monarch serves as a warning to enlightened birds that an attempt to eat this attractive morsel will have nasty side effects including an upset stomach. As the caterpillar grows, it sheds its skin many times before becoming a pupa. The fully grown caterpillar assumes the "J" position just before pupation. Just before the transformation to the pupal stage the caterpillar attaches itself to a leaf or stem with silk and rests suspended from the plant in the shape of a “J”. The last larval skin splits open to reveal the pupa, also called the chrysalis. In about a week the monarch butterfly emerges from the chrysalis and begins the tasks of finding nectar to eat and a worthy mate to carry on the royal lineage. Two excellent references, “The Butterflies of North America” by James Scott and “Foraging Dynamics of Bird Predators on Overwintering Monarch Butterflies in Mexico” by Lincoln Brower and William Calvert were consulted for this story. To learn more about monarchs, their biology, and how to raise them, please visit the following web sites.